You know what holiday is right around the corner? That's right, Valentines Day! Also known as the holiday I absolutely hate the most. I really think it's stupid, but we shall wait until my Valentines Day posts to see why. This manicure I did using Essence Ultimate Pink reminded me of the holiday due to the very pink colors! If you need a perfect pink for your holiday manicures, I suggest this. As stated in my last post, Essence sent me a couple of polishes to review, which I have been super pleased with. Each have surprised me and made me now want to wage a war with Ulta to ensure that they are always stocked in my store. For those of you who have never used or seen an Essence bottle, the bottle top matches the color of the polish IDENTICALLY. Seriously, it's amazing when you have a hefty stash of polishes. It annoys me looking down into my drawers and seeing tons of black caps and little snippets of color. I usually end up taking out 10 polishes before determining which one I want to use. With these Essense polishes though, there is none of that. All companies need to take a lesson from them. Oh and also, their caps are awesome because they kind of snap shut. You have to use it to know what I'm talking about, but I love it because I know that my polish is truly closed. I'm rambling, time to take a look at the awesome pink manicure that I wish I kept on longer! I cannot wait for my new dotting tools...you guys are going to be spammed with so many dot manicures, it will be crazy. Essence Ultimate Pink is a gorgeous pink. I really, really, really loved it. When it was combined with the other pinks too, it was even more jaw dropping. I had complete coverage with two coats. As I said in my last Essence post, I loveeee their brushes! They aren't too thick, and aren't too thin, and literally with two swipes your whole nail is covered with polish. 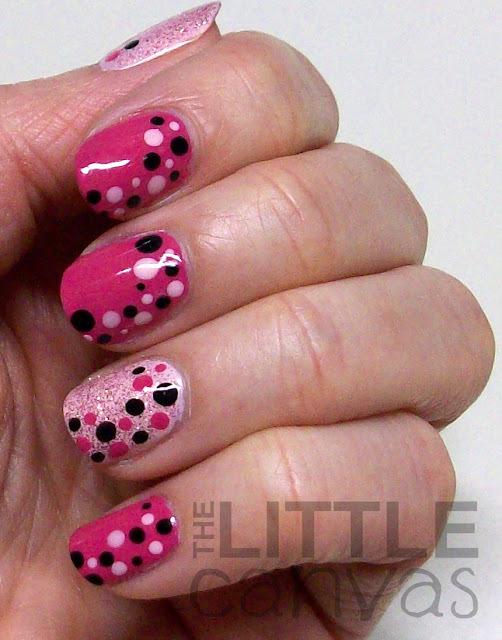 It was very easy to dot with too for as fast as the polish dried. Usually dotting with fast dry polishes is impossible because they quickly get goopy and they leave lines behind, but I had no issue with it, and I got the perfect dots! What do you ladies think?? Love, hate? 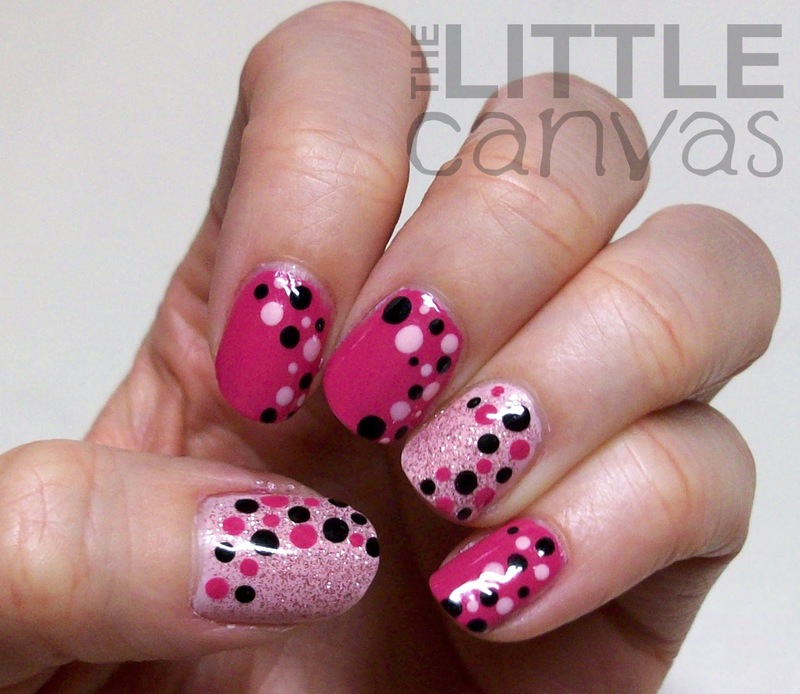 I'm seriously falling in love with Dot-icures. 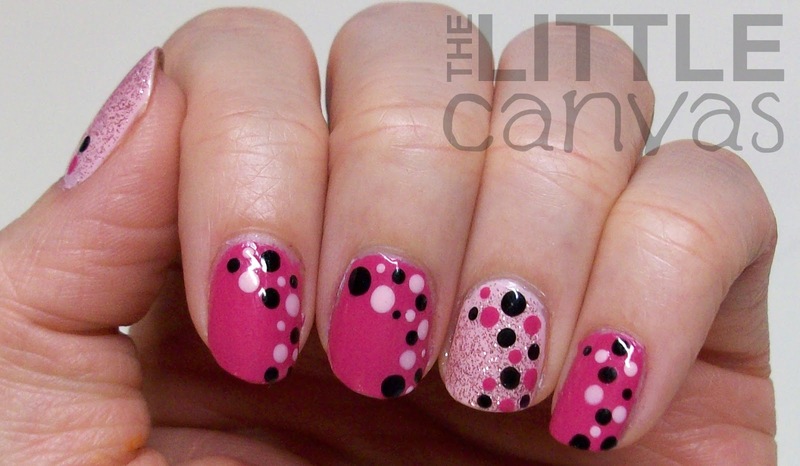 I love how you did this with the accent nail and thumb. I'll have to stalk my Shoppers for this Essence polish!